Netflix has released Season 4 of Arrested Development in its entirety, which means we'll be binge-watching the series' revival and sharing our reactions with you over the next couple of days. The recap below contains spoilers from Episode 4 - "The B. Team." Read no further if you haven't seen the episode yet! Throughout its initial run, I never quite understood why Arrested Development kept Maeby’s satirical Hollywood career mostly parallel to the main story, instead of weaving it into the bigger picture. “The B.Team,” with all of its movie industry potshots, slams the two worlds together successfully, though the new character-centric format makes it less like an official A.D. episode and more like the first act of the long-rumored movie. This new season is really giving us a different world than the one we’d grown to love, but I’ve already grown to love this one, in spite of the differences that I’m sure some people out there are already moaning about. When we were last hanging out with Michael, he was a schlub who got kicked out of George Michael’s dorm room. Now he’s a man with a plan and an in-flight magazine article that gets him a meeting with Ron Howard, who gives an extremely down-graded and naturalistic send-up of himself as an intelligently ego-centric movie mogul and co-founder of the healthcare-free Imagine Entertainment. (More Little Rons!) He owns the Apollo Lunar Excursion Module that the 1969 moon landing was filmed in. Come on! Because his films are inspired by photographs, he wants to make a movie about Michael’s life, and he thinks it would be a lot more fun to see Michael’s wife die. So this story is now set in motion. The intertwined B-story is Michael’s infatuation with an actress (Isla Fisher) following their non-non-ironic meet-cute. We eventually find out that she’s Ron Howard’s daughter Rebel, only Michael thinks that she’s Howard’s mistress. I really wasn’t a fan of the awkward meeting (“I am a mooby producer!”), but by the time we got to her live Scottish band performance, I was behind Fisher’s character fitting into this surreal environment. 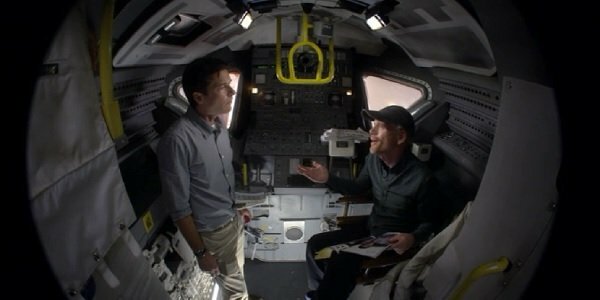 And though the stakes (possibly) aren’t very high when it comes to how their relationship will affect Howard’s view on the movie, it will probably put Michael through some needlessly suspenseful hilarity. He also lied about George Michael’s age, which was weird. Plus side to this movie angle: More Kitty! Down side: Less of almost everyone else, unless Michael gets them all involved. George Michael’s privacy be damned. I almost can’t say anything about the super-team of Carl Weathers, James Lipton and Andy Richter. It’s all so good, and though putting that much fan-love on the screen was risky, it worked out for the most part. Weathers can’t get enough “Crinches,” Lipton can’t get the hang of electronics and Richter can’t get control over his anger for the abomination of humanity that is Conan O’Brien, whose cameo is nearly the best one in the episode. Producer Brian Grazer’s casual glance at the “B. Team” in an elevator stuck between floors is golden. What other cameos were there? John Krasinski plays an assistant to Jerry Bruckheimer, who wouldn’t come out of his boat. Bruckheimer takes all kinds of grief here. Again, not much going on with anyone else here, though Michael does catch George Sr. at Lucille 2’s, though he’s not judgmental about it since all he wanted was a signature. But we do get another scene with Kristen Wiig and Seth Rogen’s young Lucille and George Sr., and we find out where their “no signatures” policy came from. “If you don’t sign, you will be fine,” and in one of the many Happy Days in-jokes, young Barry Zuckerkorn, played by Henry Winkler’s son Max, throws his thumbs up and says, “Hey!” just like the Fonz. There’s also at least one more in the episode, as when Barry says that he “can’t reach the chotchie,” which is an obvious reference to Scott Baio, standing next to him, though I have no idea what a chotchie is in this context. I honestly can't wait for more Ron Howard now. I hope he finds his way into George's story. Four episodes in and I'm still thanking most of my lucky stars to see this family back in action. "Them?" It’s pretty silly, but I love the fact that people mistake Michael’s new office for a medical imagining clinic. I hope it becomes integral to the plot. 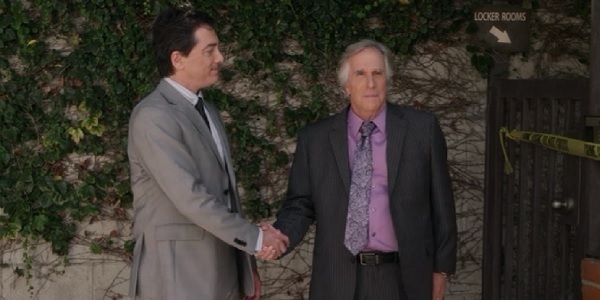 How many jokes will there be involving the Google Street Car, and how will it involve the Bluths’ illegal activities? “My deceased wife had red hair.” Michael can’t get away from death when he flirts. Jack the Ripper better come out at some point. Great callback to Rita after Rebel’s “Make her mentally challenged and I’ll thank you in my Oscar speech,” comment. “Hey Gare-Bear, we got an ostrich.” How many other ways can a show possibly work in an ostrich reference? 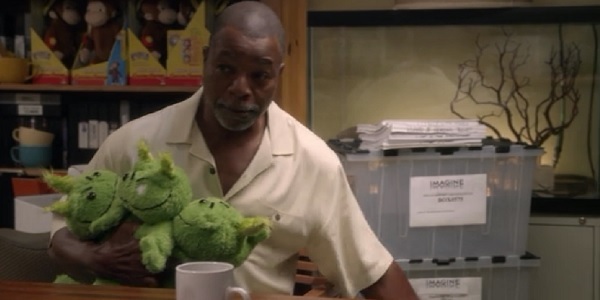 I would watch all the Scandalmakers, especially Carl Weathers’ last one. More African American moving men! Read more Arrested Development recaps here..